Welcome to our 7th episode in our new podcast series in which we talk about tax delinquent real estate that offers us opportunities to invest in real estate where the owners have not paid the property taxes. It’s a specialty area of REI that has very little competition yet can provide huge profits! Intro: Are you ready to transform your financial future? Here’s your chance to see inside the mindset of self-made millionaires, Jack and Michelle Bosch as they go back the curtain on secrets that can make you rich. Discover how everyday people are breaking the norms and building empires from the ground up using little low yet proven and time-tested wealth building real estate strategies. It’s my pleasure to welcome you to the ForeverCash.com podcast, and introduce you to our hosts, serial entrepreneurs, investors, educators, and best-selling authors, Jack and Michelle Bosch. Strap yourself in for the ride of your life. 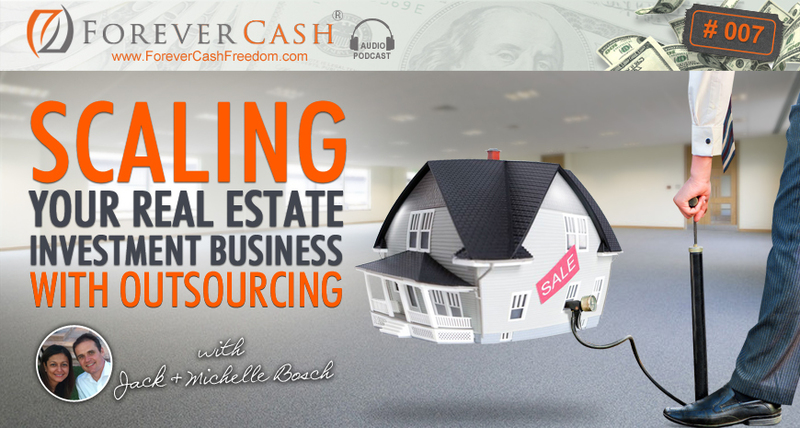 Jack: And we are excited to share with you another podcast of the Forever Cash Real Estate podcast that we specifically focus on tax delinquent real estate. What does that mean? Tax delinquent real estate means real estate or opportunities to invest in real estate where the owners have not paid the property taxes. This is probably the least known area of real estate, yet it’s the one with probably the highest profits in the entire industry hands down. Now I’m not just saying that, I’m saying that because we have the proof of over 3000 going on 3500 deals of having done, well of having done deals and looking at every single deals. We have bought properties literally for five cents on the dollar, five cents. We have gotten properties for free with free and clear with equity– all they had is back taxes outstanding. So very quickly before we get started and we are going to actually– what are we going to talk about today? Michelle: I have an idea. Why don’t we talk about how do we bring this tax delinquent real estate business into a model that we can actually scale, not just a hobby investing type a deal where you, you know, flip a couple of deals a month but where you can actually really create a sustainable business out of it. Jack: Wonderful and I have an idea of how we do that. We do that with what’s called outsourcing, right? Jack: So we’re going to go– I love that idea. So I suggest we’ve got to go to the process of the entire land flipping or house flipping process very quickly and identify on each step whether or not you should do it yourself or it should be outsourced to somebody else. Does that sound good to you? Michelle: That sounds great to me. Jack: All right wonderful. So before we get started I wanted to touch on the tax delinquent real estate. So basically the entire premise behind everything we do is that there is people out there who do not want their properties any more: houses, condos, land, industrial property, commercial property, you name it. And when they don’t like their property anymore or if they don’t have the money anymore to pay the property taxes, well guess what? They stop paying the property taxes on these properties. Michelle: It’s a twist on that. Jack: It’s a twist on it but it’s a very, very important twist. And so instead of attending these auctions we go sidestep these auctions, we go directly to the owners that haven’t paid their property taxes in many ways and many times for years. They really have no more interest in these properties. They just want to get rid of the properties and they’re willing to give up their properties for pennies on the dollar. I just heard from one of our students, he bought a $90,000 house for $12,000 and we just did a deal where we bought a $200,000 property for $10,000 and so on and so forth. So deals like that happen all the time and we personally have done over 3000 deals going on 3500 very soon. So that’s the premise behind what we’re doing. Now we have to develop our own special methods to go about that and pick up pieces of land for anywhere between five and 25 cents on the dollar and pick up houses anywhere from– I don’t know– from 20 to 60 cents on the dollar. And then these are perfect deals to either rehab yourself or flip to other people. So that’s the premise behind everything we talk about. This entire podcast is about tax delinquent real estate investing and about the twists and changes and the tweaks that we have made to traditional real estate investing to get even better deals for less money than any other real estate investment technique. Michelle: Michelle is the smart one. Jack: That’s right, there we go. Excuse me I needed to say that properly. Michelle is the smart one and I’m the crazy one or I don’t know if I’m the crazy one but I’m like having the ideas and things like that and Michelle keeps me in reins, she makes sure that we actually implement certain things. So I’m really excited to do this podcast together with her because she’s very, very good at what she does and we’re going to have some fun today. Michelle: Just a little bit more organized than Jack but that’s about it. Jack: All right. Well that’s very kind of you to cut me some slack there too. Okay, and then lastly before we get started, I want to make sure that you guys know that you can get a free mini course on tax delinquent real estate investing at our website Forevercashfreedom.com. That’s again, Forevercashfreedom.com. We call these podcasts Forever Cash because at the end of the day real estate is not just about doing deals. It’s about building wealth and it’s about building wealth that lasts forever and that brings cash flow forever. So with that I would suggest let’s get started on how we can actually build this as a business through outsourcing. Michelle: Okay. So now let’s talk about then how we can take this tax delinquent real estate hobby of maybe possibly, you know, flipping two to five deals a month to actually flipping many more than that. And to begin that process or that mindset of how to basically grow this from hobby investing to an actual business, I want us to talk about basically or to think or imagine a continuum and there is a continuum where on one end– and I’m going to basically here bring in an example from Vegas to make this clear. So on one end you have of that continuum, you have Siegfried & Roy. So I don’t know if you guys have seen or have heard of the show with the two guys, with the white tigers. And so on one side you have Siegfried & Roy and on the other side of that continuum you have the Blue Man Group. The Blue Man Group, it’s basically a group of blue man, they have blue faces and I think they’re dressed in blue as well and they started actually with just one show in Las Vegas and now they’re all over the U.S. Actually for a matter of fact, they’re all over the world as the Blue Man Group. Jack: Right, there’s a Blue Man Group Germany where I’m from. Jack: And because they are blue you can’t really tell if it’s really a different person because as they’re painted blue, they kind of all of the same. Michelle: Exactly. So on one side you have Siegfried & Roy and on the other side you have the Blue Man Group. So what happened to the show of Siegfried & Roy when Roy actually got attacked by the tiger? Do you know? Jack: It went out of business, literally they canceled the show. They couldn’t even do their show even the next day; they couldn’t show it because he never really recovered. Siegfried & Roy are out of business. Michelle: Exactly. So we want to think about Siegfried & Roy and the Blue Man Group and when this applies to you in the real estate business you want to think about what part of this tax delinquent real estate am I going to focus on is crucial to the success of the business. Basically what activities will you be doing yourself? And what activities on the opposite side of the spectrum, for example the Blue Man Group, should you be outsourcing? And somebody else be taking care of this so that you can spend time on the things that are crucial to the business so that you can maintain momentum in that business because momentum will basically be the one that solves many problems, it will be the one that gets deals done on the purchasing side and the one that gets deals done on the selling side. So you want to basically distinguish which are the key activities that are going to keep that momentum going and that you will focus on and yourself and some of those activities you will actually outsource to keep the momentum of the things that you’re going to actually still keep in-house and that you will continue to focus on. Jack: Another way of thinking about it, the word that popped up in my mind is really also branding because obviously we’re not going to talk about branding in this podcast too much but it has something to do with it. Because if you put yourself out as your name being the top rehabber in the– or the top wholesaler in the industry out there in your city and you get eaten by a tiger– obviously hopefully you don’t get eaten by a tiger but let’s say if you do get eaten by a tiger then what happens? You’re out of business but if you create a system. Michelle: I’m sorry; I’m still having a visual of the hangover with somebody with a tiger in the room. Jack: So absolutely. So again if you are eaten by a tiger, although hopefully not, but you know what I mean, if something happens to you, you don’t want necessarily your business to go down and it doesn’t even have to be a tiger that eats you. Well if you want to go on a two months with vacation, if everything relies on you then you cannot go on a one or two months vacation because your business is going to come to a grinding halt. If you however build in systems and outsource a lot of pieces of your business then your business can continue running while you’re out there. Now in the case of Siegfried & Roy and the Blue Man Group, both have tremendous brands but one of them, everything relies on Siegfried & Roy or relied on Siegfried & Roy. The moment one of them fell out, the show was over and the other one, it just relies on a systemized outsourced system of blue guys that know their routine that can be swapped in swapped out. If one wants more money and the organizers of the show doesn’t want to pay him more money, guess what? They can swap him up with somebody else and that’s capitalism, I know it might be good or bad but that’s how it is– and if somebody gets sick, another one can come in. So as Michelle just said– so it has a branding thing, they’re both branded very strongly but one is branded as a system. The other one is branded as a person. So think about your own branding but in essence in order to make that transition into something that can live even if you are on a vacation or let alone God forbid be eaten by a tiger, you have to transi– you have to think about transitioning from there on that continuum from the left side which we have—we have this kind of continuum here on our wall here and on the left side is the rugged individuals and on the right side is the Blue Man Group. You have to go from rugged individualists over to the bluest– Blue Man Group side as much as you’re comfortable with or as much as you can even if you’re initially sometimes uncomfortable with it. So should we get started after talking about tigers and stuff like that? Should we get started with the actual process? Michelle: Okay. So the actual process and I’ll basically just give you a summary at the beginning. Jack: And by the way podcast session number six talks about how to get a highly motivated tax delinquent list. So we have all the details in there, we won’t cover it right now so go on. Michelle: So on the purchase side that’s step number one. Step number two is actually mailing out basically sending letters to these delinquent owners that we’ve identified on step number one and once those mailings are out, we will then move on to step number three which is actually receiving inbound phone calls from all these people that are interested in selling. And step number four would then be a very, very critical crucial part of this whole process which is the actual deal analysis. Even if you had– basically this is the heart of it. This is the core of it, this is one thing that either you can find somebody somewhat experienced to help you with if you’re starting off or you want to learn yourself very well from the beginning. But this is something that you want to keep in house is what I am saying until you are ready or you find the person that you can basically outsource this. But at the beginning, the analysis the deal analysis is the fundamental of this whole thing. If that is wrong, if you’re– if for example comping up a property getting comparable values it’s not accurate, the entire deal basically faulters under this one step. Jack: And by the way we’re going to have– if you listen to this podcast after its been out already for a while, you can probably go and look at the subsequent podcasts and there’s going to be some in there that actually explain some of the deal analysis steps and probably multiple podcasts going to that subject because there’s a lot of meat there, a lot of things we can talk about. And if you listen to this as a brand new podcast that just came out, then we’re going to publish them in just a couple of weeks. So stay tuned, make sure you actually subscribe to our podcast. And by the way I want to remind you again that you can actually– just for listening to this podcast we want to give you a gift, actually a mini course. You get instant access to a mini course that explains the tax delinquent real estate investing, concepts, and goals, and quite a bit of detail, video Course that you get instantly access to all modules at once. And you can get that at www.forevercashfreedom.com. So I just wanted to interject that. So now let’s get back to the process, we have—you said we have a list. Jack: We mailed it out, the people called back. Now when you do land deals like we do with them, you can expect 10 to 20% of the people to call you back, it’s really outrageous. If you do house deals you get a little less callbacks but you still get the high quality callbacks with tons of equity, tons of motivation. I mean it’s really out of this world. Funny or great how many calls you get and how good of the calls you get and then you do the analysis. You just cover that. Jack: And we mail them out quickly because we make a lot of offers. Michelle: Yeah. We do we them in batches of 100 or 200 at once. Jack: When you send out a 1000 letters and you might a couple of 1000 letters then you get 100 phone calls and you’re making 90 offers, you don’t want to call these people by phone, you just want to send them out an offer by mail. Jack: Oh my God, you might just get a deal. Michelle: So then what happens is usually contact your seller, you tell them that you’ve received the acceptance and you’re excited to do business with them and then you move on and you either go one or one of two routes. Either you decide to do the closing in-house which in a different podcast we’ll explain how to go about that and under what circumstances you want to outsourced it. Jack: I want jump in the second and do it but first say the other option. Michelle: You want to do it in-house. The other option is to actually outsource it to a title company. Jack: Absolutely. So just a quick intersection here and by the way, this is how it works when you’re dealing with a husband wife couple, they interrupt each other all the time. Guys remember we’re doing land deals and house deals, and when we do land deals we focus on land deals that are worth under $80,000 and in some cases you might get a $10,000 land deal that you only pay $500 for. Now if you only paid $500 and the title expenses, with the title company and the title attorney and all the closing, costs you a $1000 it’s sometimes not worth hiring a title company and spending all that money. And you are sometimes better off just doing the title work yourself, drawing up the deed yourself and doing things like that. Now you don’t have to. That’s why Michelle said the other option is to do the title company and for houses we always use title companies. Jack: But for certain land deals we do the closing in-house, and that’s again that goes towards the rugged individualist or the Blue Man Group but it’s also a consideration of– if I have to pay $1000 to insure a property that I bought for $200, it doesn’t make sense so I rather do it in-house If I have the time for it. So that’s just a little side note if in case you wondering, well why would you ever do a deal in-house? Well if you paid that little for a property it sometimes might be worth doing the title search and the title– or the drawing up the paperwork and drawing up a deed and so on yourself in-house but it goes back to the exact question that recovering here. Is worth it? Should you do it or should you outsource it? Michelle: Yeah absolutely. So that pretty much– once you have an accepted offer and you’ve decided to open Escrow with a title company and get the title work done, the purchase side basically of the transaction of this deal is taken care of. Those are pretty much the activities that go into that. Once you are in the process of selling the property, the activity that comes first is really now well closing on the property of course so that you own it. But even prior to closing you can already start advertising that property and in order to advertise it, you need to number one create a listing for the property, yeah. Number two is actually advertise, either to your existing buyers list or on different, you know, depending on the type of property that you’re selling, on different places online. Jack: You mean seller financing. Michelle: Seller financing, yeah. If you decide to sell for cash, you know, title company is going to drop a deed where the property is being granted over from you to whoever you’re selling it to and if you decide to actually offer seller financing, you could probably sell that property with that land contract. Basically a contract for deed and at that point you basically would either again service the note yourself or do you outsource also to an escrow company for them to serve as the note on that property where you’re offering seller financing. So that’s pretty much the just of it on the selling side. Jack: So there’s lots of decisions to be made. This is fairly simple, I mean yes there’s about eight or 10 steps here that we just mentioned but at the same time, did you hear us talk about mortgages? No, right? Did we say mortgages? Jack: No, because when we do these deals, when we do either house wholesaling or we do land wholesaling or sometimes we do or often actually we do land retailing with seller financing, the only bank involved is you because when you sell something with seller financing you become the bank. So– but there’s no banks involved, there’s no appraisers involved, there’s no inspectors involved, there’s none of this stuff that is in other kind of real estate investment areas involved because typically in tax delinquent real estate you get the properties for so cheap that you can just make an offer and get a deal on a contract and so on and so forth. But there it is about eight to 10 steps here involved, let me count them here: one, two, three, four, five, six, seven, eight, nine, 10. Nine to 10 steps involved depending on how you sell the property, and these nine or 10 steps you need to make a decision on whether or not you’re going to do them yourself or whether or not you’re going to have them be done by somebody else. And that really is going to make the decision on whether or not you are going to become the rugged individualist and do this yourself. Michelle: Or Siegfried & Roy. Jack: Or Siegfried & Roy, or whether you are going to become a Blue Man Group kind of business, right, that has lots of teams around you. Yes it kind of– of course you still pull the strings. The Blue Man Group still there’s a core team that does that and there’s the original four or five blue men that probably now have retired drinking margarita on some beach but they still are probably in charge of making sure that– of the hiring and making sure that all these are other blue men stuff happens around the world. But they– the business does not depend on them doing the individual show themselves anymore, all right? So therefore if we go through the list again we have the following choices. Getting the list: well you can get the list either yourself or you can see if there is a service out there that you can get it. Now we’re looking for tax delinquent information and to the state, there is very, very few if any services out there. There’s no standard services that I know of that you can get this data from. Now we’re working on building that ourselves and once we build it there’s probably going to be a podcast that announces that we have this available but in the meantime there is no way that you can really—I mean you can outsource it by having somebody else go get the list for you. But other than that the process is still a hands on process that you probably can’t outsource that much getting the list. However once you have the list, you got to do something that we call list processing. Jack: Because typically you get that spreadsheet, you get that list in form of an Excel database. Jack: Process within a day. Michelle: Yeah. Well but it’ll take them an hour. Michelle: It’s going to take you forever. Jack: It’s going to take you forever and you are going to have to do something that you neither know how to do nor do you like how to do it. So do outsource that step, get the list yourself but then outsource the processing to somebody else, and when I mean processing basically some of these lists they have a one data record for every single year that the properties has been out. Now you don’t want– if some property owes property taxes for five years, that property is in that database five times. Michelle: So you want to get all the duplicates out. Jack: Yeah, you don’t want– since you are using that database or that Excel spreadsheet to send out your letters later on, you don’t want to send the same person five letters for the same property. You only want to send them one letter. Therefore you have reduplicate it, you have to take some duplicates out. There is certain other filtering criteria they have to go through that we described in one of our programs, for example at Landprofitgenerator.com or in the other program for this, for the land flipping or the house flipping it’s flipitfastformula.com. Again www.flipitfastformula.com. You can check it out there, watch some videos and so on and so forth, but bottom line is there’s a few criteria that you have to filter it down and this podcast is not about the criteria, it’s more about the outsourcing. So you want to outsourcing that massaging of that list, so that it ultimately becomes what you need to send to your sellers and good. The next part– the same question is on the next part. Michelle: It is. So once you acquire the list, if you process the list– if you leave that list sitting in your hard drive and you don’t actually mail out letters using that list of delinquent property owners, there’s no business. So the mailing is key and the mailing is key to keep a constant drip going of mailings, and in order to do that you can either decide to basically every day print out, and fold, and stuff, and lick envelopes, and stamps envelopes and mail out– I don’t know, 50 or 100 or yeah, 10 letters at a time every single day. Or you want to schedule this with an outsourcer to a mailing house that can do this for you where you can already, you know, six or eight weeks out already have a list of letters that is going to be going out prepaid and you think about it once, you plan it once and then you don’t have to think about it for the next eight weeks. Jack: And let me ask you, what’s easier? Sitting down every day having to remember that you want to send out 25 letters a day or whatever the number is– perhaps you want to send out 500 a week and you get down and once a week you sent out 500 on your kitchen table and you printed out, and you have to fit the envelopes one by one, and you have to sign them, and you fold, and stuff, and seal them, put a stamp on there or is it easier to take the list that you now ultimately have that perhaps has 10,000 records on it. Chop them off into 20 blocks of 500 and then submit them to a mailing house one time until the mailing house, “You know what, sent this one out this week, this one the next week, this one the following, this one the following week or if you only send out a 1000 a month every two weeks, whichever your schedule is.” But tell them ahead of time and then perhaps a prepay for them or whatever your budget is perhaps you only take a few of them and put them together send them there. Budget once you submit them all and you never have to think about it again. Wouldn’t that be much easier? Wouldn’t that free you up to spend your time on actually finding more deals, and spend your time on analyzing the deals, and spend your time on- on, I mean I don’t know playing with your family for that matter, instead of printing, folding, stuffing, and sealing, and stamping letters. I mean the answer is obvious, one thing– doing it all yourself is rugged individualist, the other one again is the Blue Man Group activity. You will sit and sip margaritas while the mails– while the mail list go out for you. Jack: And on top of it if you pick a good mailing house like we like for example, letterprinting.net, so again you can go to www.letterprinting.net. We like them because their minimum is $500, 500 a year per letters, and they’re doing an awesome job. They actually do it for the same money than you can do it yourself because they do this in bulk. Jack: But it’s not really more expensive. Jack: It depends which technique you use if you go after houses, you can probably handle the response rates on 500 to 1000 letters. If you send after land, you won’t be able to handle the response rates. Michelle: So what’s going to happen is you’re going to be on the phone whenever the seller decides that it’s a good time for them to speak to you. And when is the best time to talk to a seller? When they are ready to speak to you, so you’re going to have to take the phone call no matter what, and while you’re on that phone call, another phone call is going to come in and well, and so you’re done with the first caller and then you’re going to listen to the voicemail on the second caller and while you’re listening to the voicemail of the second caller, another call is going to come in. Jack: Because effectively in the land area when you send out the thousand letters at once, you can count with getting between eighty and two hundred phone calls in a matter of a week to ten days. So good luck taking those yourself if you want to do those yourself. The solution to that is either slow down your mailings and only send out 250 a week, then you can perhaps handle it, but then you can scale it. I mean that you get a deal a week, or a deal every two weeks, or something like that on the on this mailing side which is cool, but if you want to do a lot of deals then you cannot scale it yourself. The question behind this is really whether or not you should do this yourself, is like how much can you handle, and how many deals that you want to do? Somebody that only sends out 10 letters a day can handle their own phone calls. If you want to build this as a business though, you cannot take your own phone calls, you’re going to have somebody else do it because you don’t want to work for 6.75 an hour, or eight dollars an hour, as a call centre person would. Instead you want to work the $10,000 checks to the $20,000 checks. Michelle: And in order for– to outsource then the phone calls you know that requires, yes a little bit of planning, it requires that there be a script so that the people that are answering the phone are getting all the print information that you make and that you need in order to analyze the deal and present an offer. So there is some planning with the outsourcing of the servicing of those inbound calls, so that’s the next step. Moving on the following step is actually the analysis the deal analysis, and this is one as I had mentioned earlier that is so- so critical at the beginning for you to understand to get values right, that this is something that you probably at the beginning want to hold onto. This is one thing that you might not want to outsource right away until you find another person that understands, or that you can basically train and understands what you’re doing, and basically has gray matter in between both ears and can actually think, and have some critical thinking skills. The analysis is one that at the beginning I think you should keep, and even though it is on the side of the continuum of being a rugged individualists, I think it will serve you well to start with. And then as you grow and as you get comfortable with basically the processing, managing other people, you can then think about basically having somebody else take care of this analysis and moving down the continuum from doing it yourself, to the to the Blue Man Group concept. Jack: Right, so we did that for years ourselves, and even to this day before making our offers which is the next step, we’re still looking at the results of the research ourselves, double checking some of these things because the research is really a crucial part because if you do the research wrong, then the value analysis of the property wrong, then the entire offer everything’s going to be wrong rounded it. But you can teach this to somebody over time but first you have to master it. As Michelle just said that something that you probably want to keep in house, but so far everything almost everything else other than getting a list you’re actually outsourced. So now we just have two things getting a list which is a onetime thing every few months, and then analyzing the deals, which is not that much of a big deal. Because as you get better and better you get that get shorter, and shorter, and shorter, and shorter. Like just think about it if you find a house in the neighborhood for the first time, in a new neighborhood for first time, you have spent a little time to get a feeling for the prices in that neighborhood, the next deal in that same neighborhood that’s a similar house, how much extra time are you going to have to spend almost none, right. You don’t have to spend extra time, because you already know right away about the value of it is. Even that is something that once you learn it, it goes very- very quickly. Michelle: So then the next step is the actual offer presenting the offer and this is also something at the beginning you want to do yourself. And it’s basically it’s based on the step prior based on the research, and based on the value analysis. You decide to I don’t know sit every Thursday and for every phone call, and every property, that is a prospect right now there has been researched, you want to sit down say on Thursdays and write you know fifty, a hundred offers at once. What I mean by that is actually assigning the offer the dollar amount, and then the actual printing of the offers that is something that also can be outsourced and somebody can help you with. In terms of printing them out, and stuffing them in an envelope, and putting a stamp on it, and actually mailing it out, so that one is one that where you actually have to give the dollar amount, but everything else you could have somebody to help, either a family member, or a student, or just a contractor, somebody that for very little money an hour can basically crank those out for you. Then the next step after the offer making is actually the title work, again we said you could either go in house, or doing it yourself, or you can depending on the value of a property you can actually outsource it to a title company. And this is nothing more than basically having already a title company and an escrow officer lined up, that you can basically open escrow with and then you can follow up weekly, to make sure that your deal gets close before the close of escrow, before your contract expires. For the most of it you know all the leg work in terms of doing the title search, will be done by the title company. You’ll just be presented probably with the results. If there’s any problems they’re going to tell you how to fix them, and they’ll drop all the documents, they will be in contact with your seller, so that the seller signs their part of the documentation. So your work at the beginning here is really just identifying a title company, and an escrow officer, and opening escrow, and following up. Jack: Right in the beginning I talked about certain scenarios where you might want to do the title work in-house, but I want to make a clear- clear statement that we are have been telling all our students for years now at all our live events, and all our coaching students, everyone is, “At the very beginning when you are a beginner in real estate, you never want to do your own title search, and your own title work and so on, you don’t want to do or drop your deeds.” That’s something that down the road as you become really- really good at that and as you get some tremendous bargains like, almost like properties for free or some lower value land that might be only worth $5,000 or 10,000, that you get for a $100 or $57, which we have done hundreds of deals like that. Michelle: We were a complete do it yourself, everything we did ourselves. Jack: We did everything ourselves because what we– and that’s another consideration-had was a little bit of time, but we didn’t have any money. We started this business with $3,500 to our name, everything in our house was paid in monthly payments, we had payment up to our noses, and we didn’t want to pay for a title work. We basically valued our money more than our time and as a result we basically decided to keep our own money and instead work on– work with our time on that. I worked late nights, weekends, and so on, on these things and– but rather saved a few bucks on title insurance. And that works if that is you, but it shouldn’t stay like that forever, because soon enough you have, you basically have created yourself another job where you just do title work all day long, and instead of upgrading yourself a lifestyle of doing deals making money and enjoying life. Therefore, keep that in mind if you right now say, “I don’t have any money to pay title insurance,” well then make that decision to do it yourself for the moment learn it, but if you have a little bit of money, if you have enough money to pay for a title insurance, because think about it you’re only buying deals, or you’re only paying for that, if you can flip them right away. You’re only paying for that if you only if you’re buying a property if it’s a tremendous deal. If you do a house flipping as a matter of fact you don’t even need to pay for the title insurance, or if it’s being paid out off of the proceeds of the deal. Because what you do is you flip it right away and you do a double escrow in a deal in the first place. Therefore at the end of day it’s going to be split with the seller, split with the buyer, and you paid very little of it, and it comes out of the profits that you make. Right, so having said all that, now I’m going to take over if that’s okay with you? Jack: All right, so she’s not getting upset from me taking over. Jack: I will talk all about the selling part of the business, now that you have it perhaps own this property, and again I mean if there’s multiple techniques here that we kind of mix them up a little bit, when you do a house deal as I just said, you do a wholesale deal where you might not even take title to that property. So the title insurance issue is not even an issue. But if you do land deals and you buy a $20,000 piece of land for $2,000, which literally happens all the time. Then you have to– then you can very simply just buy this property with what’s in your banking account, own it, put it on the market, and sell it, and flip it quickly for $12,000, make a $10,000 cash profit. Or sell it for about perhaps $17,000, $18,000, or $20,000, with seller financing get a $2,000 down payment, you get all your money back at closing and now you have a mortgage where you are the bank, you’re collecting payments of let’s say three hundred dollars for the next seven years. That is a nice scenario, you build 10/20 of those, you have three to six thousand dollars a month coming into a bank account, and life takes on a different quality. But now back– just to give you the different scenarios that we’re covering. Assuming that you have bought the property or at least that you have it on a contract now, you want to list it, right? You want to sell it? You tell him what you like on different websites and you put it out there and they create the website for you. Again it’s something you outsource. But you don’t even for the first few deals, you don’t even have to have your own website, you can piggyback as I call it on other people’s websites. And again it’s an outsourcing kind of thing. You might have to put the listing up yourself if you have nobody else that does it for you, but you it’s not going to be on your website because you don’t have to go to that effort at the beginning. Instead you outsource the– you outsource the posting and the posting happens on places like Craigslist. Let Craigslist worry about being on page one of Google, let Craigslist worry about their website being up for 24 hours a day and seven days a week, let Craigslist worry about, I don’t know search engine optimization and all this kind of stuff. Jack: You just basically go and create an account on Craigslist and you post your property there. The same thing if it’s a piece of land, there’s websites like landwatch.com, landflip.com, where for a small fee you can post the properties up there. They’re are highly-highly indexed on Google, meaning when people search for land on Google, websites like Land Watch come up on number one, two, three, four, and five of the Google website. Perhaps combined– mixed up with a couple of other web sites, but they literally dominate page one of Google for all kinds of real estate and land keywords. So if it’s a house there’s other websites that you can put the properties on there, you can list them up for a fee on realtor.com, you can have it listed on zillow.com and other places and so forth. So but bottom line is while you might have to put the advertising on yourself, you don’t have to host a website, become a specialist in Internet marketing, and become a specialist in– yeah in building websites, managing websites and things like that. You use other people’s websites. For example our customers, our clients that do our technique, that bought one of our courses, they get the right with it to put their property on our website, I mean our website for lands is simply called sunnyland.com, it’s the opposite of rainy land, it’s sunnyland.com. It’s a beautiful website and it has hundreds of properties out there, many of them owned by us, many of them only there listed by our students, and in combination these properties sell very quickly there. So again it’s a point that might be there’s– almost like a hybrid kind of thing. Jack: You do certain things yourself; you perhaps get the pictures together, write the descriptions of the property, but you don’t have to put it on your website because you don’t need a website starting out. You can put it out on somebody else’s website. All right and then once you have a buyer it kind of the process repeats. You can now hire the title company again, they can do all the– all the pieces there, and that’s another outsource piece. So therefore if we summarize this right now, if you look at getting the list, processing the list, sending out the mailing, getting the phone calls, doing the deal analysis, making the offers, doing the title work, listing the property, and then selling the property, and then again the titles work, and perhaps even loan servicing or not if that’s included. This is like about 10 different steps, and of these 10 different steps really the only ones you should do yourself long term, are part of the deal analysis at least checking it, at least initially you should do it yourself and then teach it to somebody else as you grow, and then making the offer is something you definitely probably want to do yourself for a while. And then perhaps preparing the advertising for it, but not having it– no you don’t need to have your website. Instead of doing 10 steps yourself, you do like two and a half steps yourself, and getting the list upfront too, so it’s three and a half steps yourself. The rest can be taken care of by somebody else. Jack: You can do so many more, and the three and a half things that I just mentioned, are things that you can do from anywhere. Jack: Because you don’t have to be in a physical location, a certain physical location to do all these. That means the world becomes your playground now, you can go down to South America, and live in Chile, or in wherever you want to live or you can go into Australia, live in Sydney, what a beautiful city just been there last year. You can spend some time there or you can go– you can live anywhere you want, you can travel around the country with an RV while doing deals, and that now becomes the focus. Therefore the focus of your business becomes building freedom through deals, instead of doing all the steps yourself. Michelle: Yeah absolutely. Any one of us that has started a business has started a business looking for four freedoms, the freedom of money, the freedom of time, the freedom of relationships, and the freedom of purpose, and so we just basically walked you through, or described how you can go from doing everything yourself in a business to outsourcing it, in the style of a Blue Man Group type of business. And you can really enjoy those four freedoms. Jack: All right wonderful. So that was a good podcast, I’m excited. So, as always I want to remind you guys before we end this, again you can get a free gift, you can get free course on tax delinquent real estate, I call it tax delinquent real estate 101. Where we cover all the different pieces on tax lien, tax deed, but also how to go around these options, you can get that at forevercashfreedom.com. And lastly since we are– this is a new podcast, we would love your feedback on it. It helps this podcast get ranked, it helps to spread the word around, and so if you could go to iTunes, and leave us a hopefully great review about the podcast, we would absolutely love that. Michelle: Thank you very much and we will be with you in the next one. Outro: Thanks for listening to the Forever Cash Freedom Podcast. Subscribe now for future content packed episodes on how to push the ejector seat on your financial hamster wheel, and discover a radical way to freedom and wealth through cutting edge real estate investing strategies. To learn more about living the forever cash lifestyle, investing smartly, and becoming financially free. Visit www.forevercashfreedom.com to claim your free forever cash starter kit today.